May be people not love for eating, but must.. If I ask do you love cooking? May be this game not likes Cooking Mama or something game which guide you to make foods. A new way for you who loves bake cake but don't know how to make it. A simulation game from TeamLava which must connect to Internet for you able to play. This game provides many cooking equipments like oven, drink mixer, ice cream maker, donut maker, n some limited cooking equipments. You can make delicious foods just one click only. No need for you to clean the table after your customers done eating. However, this game uses actual time you must waiting to serve your foods. For example: I want to make brownies, in instruction there's 1 minute for ready to serve, that's mean you must wait 1 minute or 60 seconds in actual time for serving your brownies. So many kinds of breads, ice creams, beverage, donuts with different time to serve. From 60 seconds until 2 days. You can decorate your bakery using gems or coins. 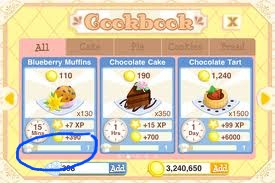 You gain coins by selling your foods, and gems are gain by buying it (the cheapest price is $4.99 for 24 gems) or you can get it by filling your cooking bar on 2 and 4. Look at the pic above..
See the blue circle. That's what I mean with cooking bar. Fill it until max 4. When you fill it at 1 n 3 you will get some coins, and get 1 gem in 2 and 4. Another way to gain gems, complete the badges. One gem for each complete badge. Like the other TeamLava game.. You must use Strom8 ID for adding friends. Your friends will become your neighbors. Leave 3 tipped for your friends at community and 6 tipped for your neighbors to raise your popularity 4 star. Some of decoration or cooking equipments need material to build it. Complete it by request to your neighbors. Remember you only ask help once a day. So, it recommended to have many neighbors at least more than 50. That's mean you just need shirt time to build your cooking equipments. Neighbors can give you food or beverage or material parts use gift button. You can accept or decline it that's up to you. 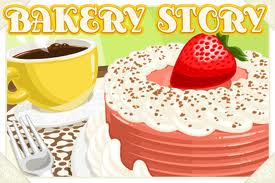 The last one, BakeryStory have social button, that's "Wall".. Leave your message at your wall or friends wall to keep in touch. 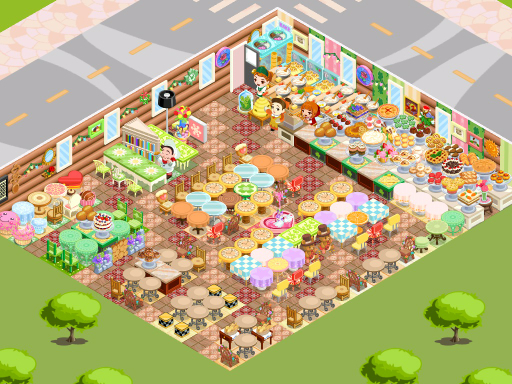 Every week you will get new update like new decorations, tables, chairs, cooking equipments, etc. Sometime, there's a limited edition item which can bought by gems only. It only available for 4 days. The update available each week every Friday. The mysterious box which cost 24 gems has limited edition item too. You need to expand your bakery too for make it bigger. There's an easy tutorial for you before play. Just need few seconds to learn it. So, what are you waiting for? Come let's play it. Additional cost may added when you purchased gems.